Originally published by Free Peike. The 7th day of trial of Peike’s higher appeal took place on Wednesday March 28. As announced during the last session, on this day the judge would make public her decision on the defense’s request for new witnesses. The request of hearing as a witness a cop belonging to SoKo Schwarzer Block (a cop unit founded specifically to investigate proof related to the “black bloc” during the G20) was denied. According to the judge, this cop cannot have more information about the incident than the witnesses Kosnik and Marx have already given. The other requested witness will be brought before court. This cop pertained to the same team as Kosnik and Marx on the day of Peike’s arrest. At the moment however she is away on holiday, so she will only be heard in the session of April 19. 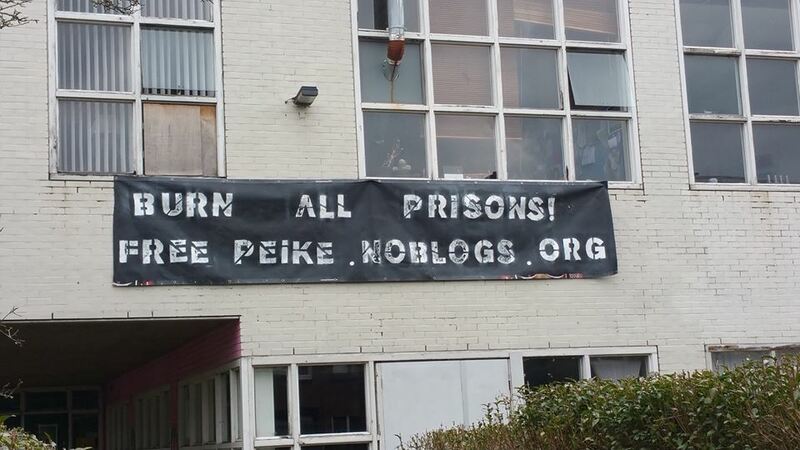 Furthermore, the defense during this session once again demanded Peike’s immediate release, i.e. awaiting the course of his court case in freedom, using as arguments the contradictory statements of Kosnik and Marx, and the repeatedly changing description of the person who threw the bottles. These arguments however did not convince the judge. The different statements of Kosnik and Marx were justified using the witnesses’ different perspectives; at the time of the incident, Marx was standing first in line, while Kosnik stood in the back. The judge also stated it is logical they did not see or declared exactly the same thing, as everything happened in a split second. The description of the accused having changed multiple times she considered irrelevant. In the judge’s opinion, in the dark a bundle of curly hair could easily be mistaken for dreadlocks. The judge continues to believe the witnesses, and still considers the original accusations valid. Finally the judge declared that her agenda will be empty after having heard the third witness; despite this however, the next two court days will not be cancelled. Her expectation is that the defense will fill up these days. In the meantime Peike continues to be strong. To everyone who is able to come to one or more of the planned court days: solidarity is still necessary and much appreciated. #NoG20 #FreePeike Day eight and nine of appeal procedure – Enough is Enough!